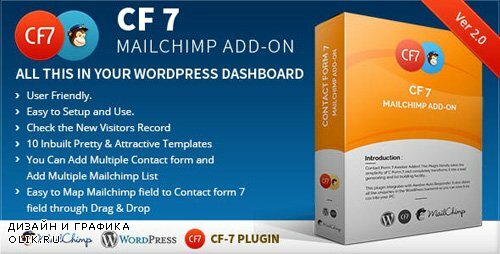 Contact Form 7 Mailchimp Addon! This Plugin literally takes the simplicity of C Form 7 and completely. transforms it into a lead generating and list building facility…. This plugin integrates with Mailchimp Auto Responder. It also stores all the enquiries in the WordPress backend so you can save it via csv into your PC. Features: You Can Add Multiple Custom Fields | Easy to Map Mailchimp field to Contact form 7 field through Drag & Drop | Don’t have to move to Mailchimp Account, just to check the new visitors record. | 10 Inbuilt pretty & attractive templates to create your own Subscriber form , with no waste of time. | Add functionality for multiple form connect to the multiple list | Check all the Broadcast campaign of your Mailchimp Account on one click. | The List Manager will give the Mailchimp List with total records of Subscribed, UnSubscribed and Total visitors. | Download into your PC’s Hard Drive, with feature of Export to CSV file. | Shortcode of the form will work on Post or pages or even in the sidebar. | Easy to setup and use. | User Friendly. | A Demonstration Video which explains all the features. | Compatible with latest jQuery and latest WordPress. | FAQ and source code are included in the package. Free | pdate in the future. | Fully Documented and 24*7 Support.